No more boring iceberg lettuce! 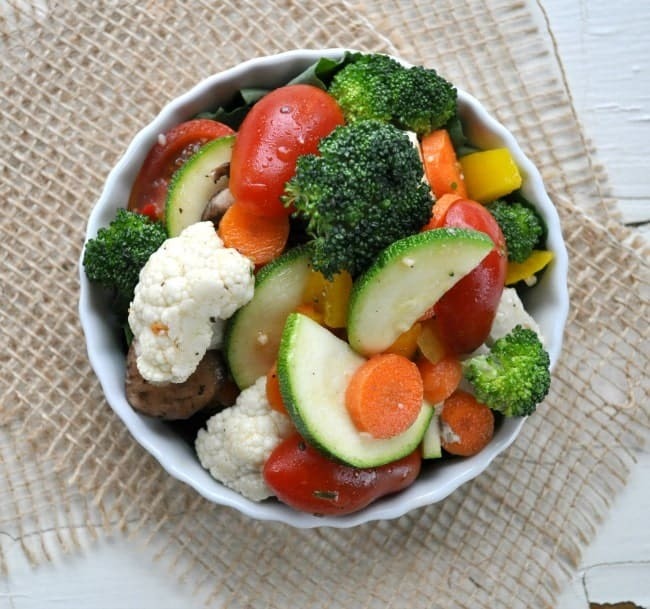 My Mom’s Marinated Vegetable Salad is a simple, nutritious, and flavor-packed way to enjoy summer’s fresh produce. 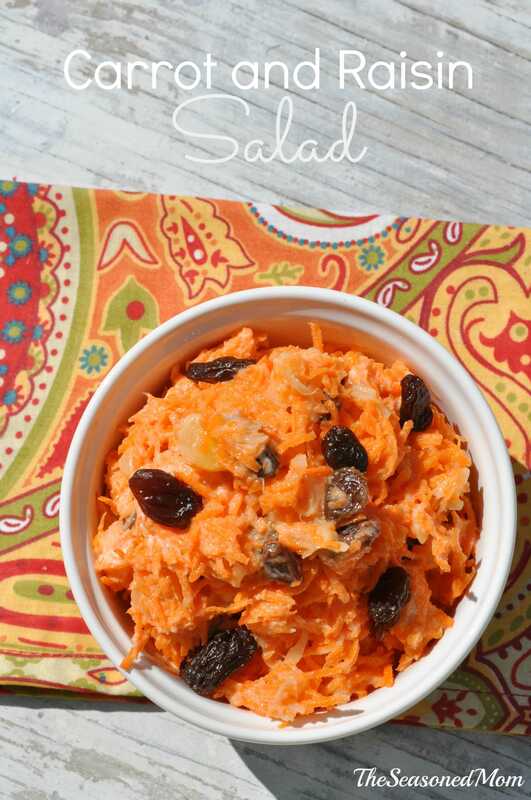 Make it in advance and you have a cool, crisp, and refreshing side dish for just about any summer potluck, picnic, or weeknight dinner. My mom was recently cleaning out her files in the kitchen and she came across her old collection of recipe cards. Since Mom isn’t one to typically cook from recipes (she’s the “improvising type” if you catch my drift), she didn’t really have much use for the old handwritten notecards anymore. So guess who scooped them up? I have had so much fun sifting through these old recipes, so many of which bring back childhood memories. You can expect to see even more “retro” recipes on the blog in the coming months, but we’ll go ahead and start with this simple marinated vegetable salad. You can really use just about any combination of vegetables that you prefer, and then toss them all together in this simple red wine vinaigrette. 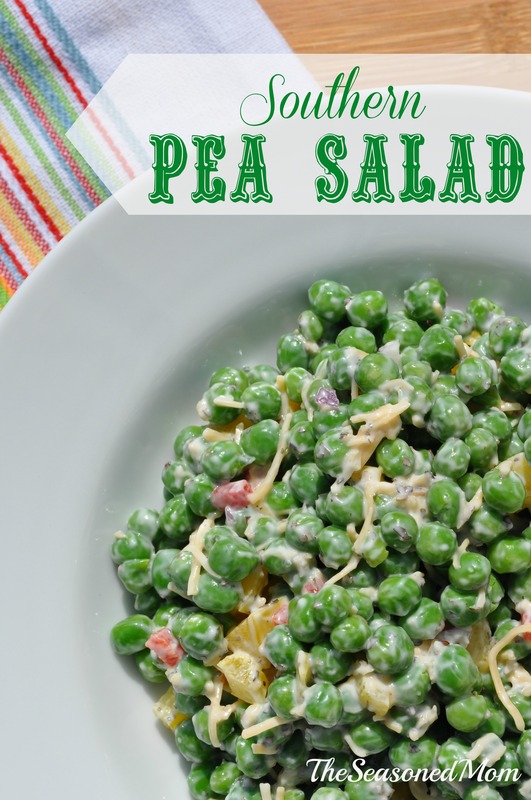 The dressing is really what reminds me of my mom…I’m pretty sure that she poured this stuff (or some variation of it) on many other dishes throughout my youth! And, thanks to the old recipe cards, now my kids have been enjoying it, too! I just had to include the photo below, which made me laugh when I uploaded my pictures and started editing them for this post. Do you see how unglamorous my photo “studio” is?! On this particular afternoon, Spencer was by my side playing with Matchbox cars as I was quickly snapping some pics. He often tries to grab the food and eat it, or he likes to push his toys along the table or board that I’m using. More often than not, I can manage to keep him out of my actual shot. But not this time! 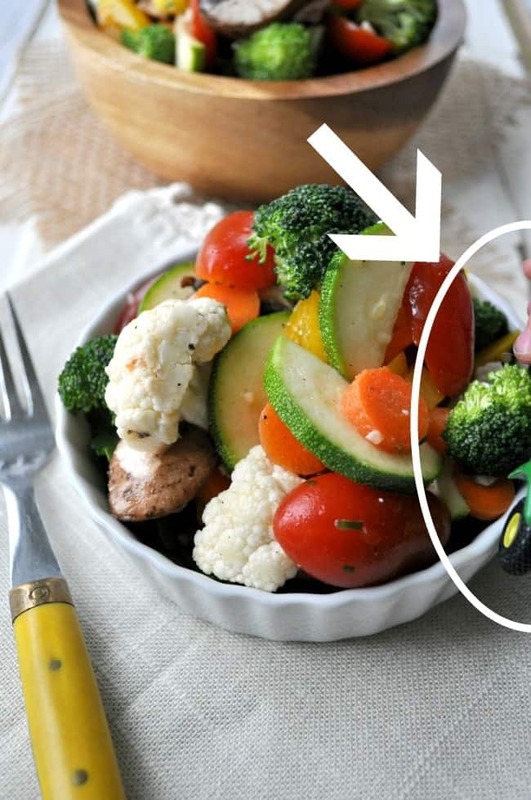 Do you see that little baby finger and the wheels of his John Deere tractor on the side of the salad? That’s just an average “work day” around here! 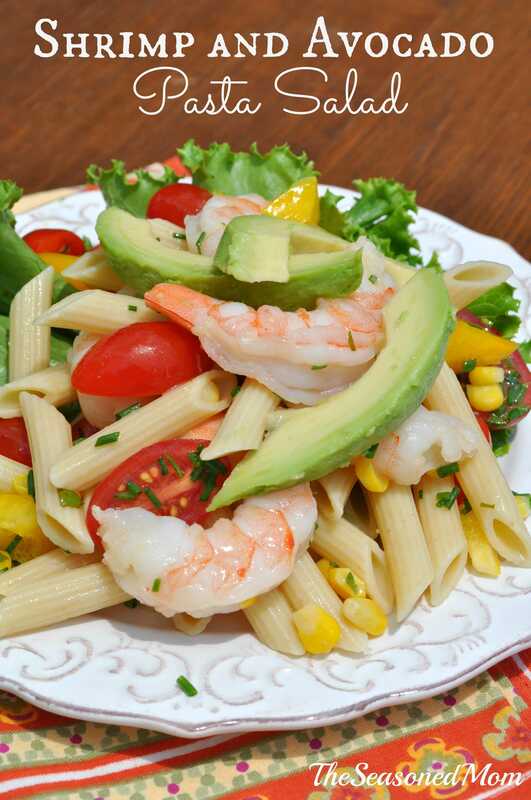 I hope that you and your family enjoy this recipe as much as we have. 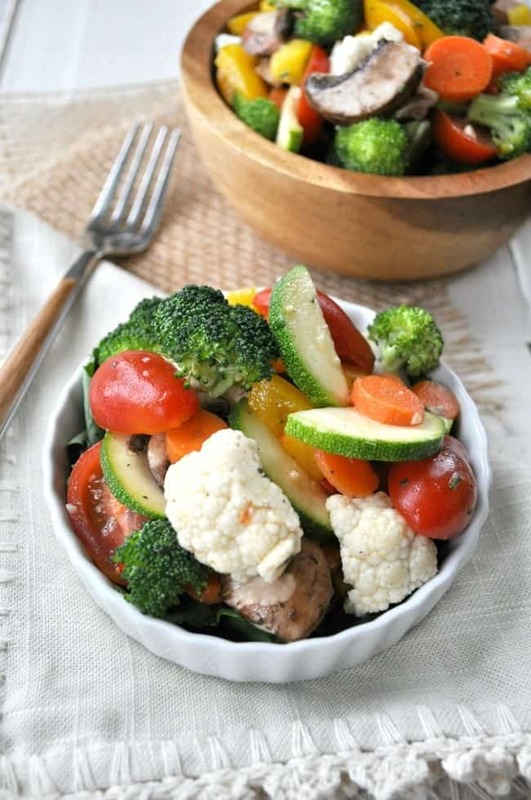 Vegetables and side dishes aren’t always glamorous, but they’re a nice component to most parties, picnics, and dinners, and a change from the typical green leaf salad is always welcome! Place remaining ingredients (garlic through olive oil) in a jar with a lid and shake until completely combined. 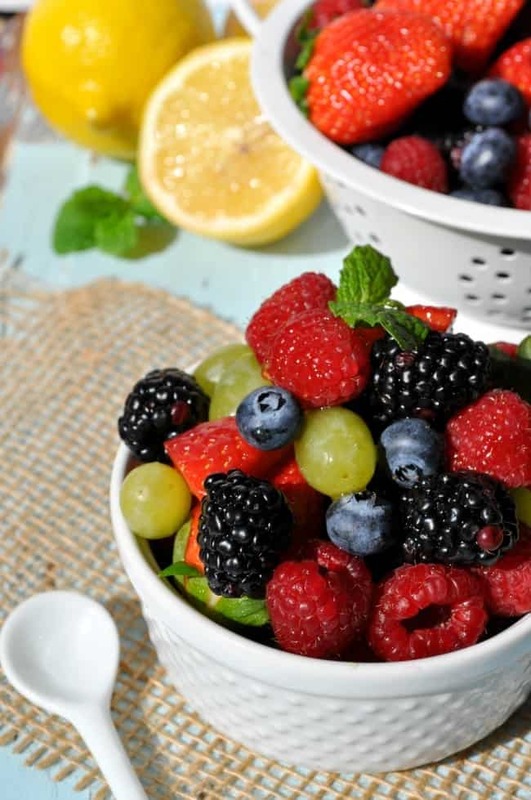 Refrigerate salad for at least 2 hours (or overnight). To serve a crowd, double the recipe! Ooh this looks like good stuff. Thanks for posting. Hello from Monday Funday. Thanks for stopping by, Melissa!! Yum! This looks so bright and crisp! I have been known to eat an entire container of cherry tomatoes on my own. 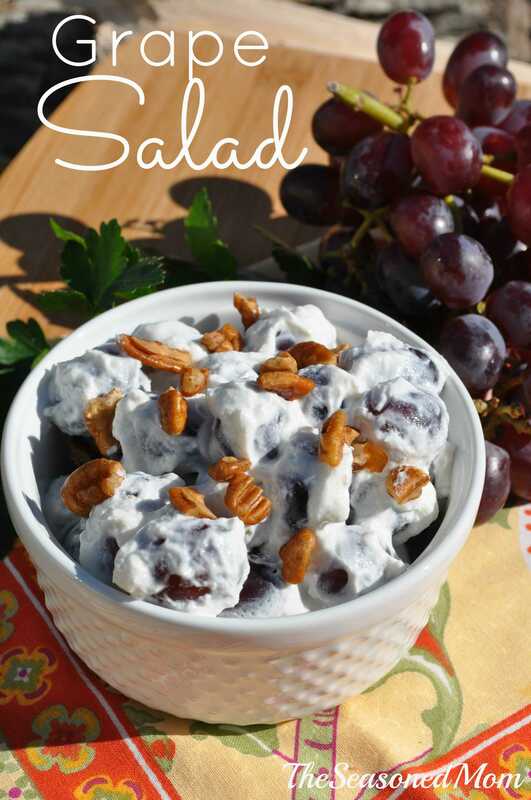 Thank you for sharing this yummy recipe with us on the Merry Monday link party! This looks so fresh and perfect during the summer! My family is going to love this! Oh YUM!! This looks absolutely amazing!! I’m a freak, I know, but raw vegetables are a major obsession of mine! I bet I could even convince my husband to love them too, with your yummy dressing! 🙂 Looks delish! I am soooo not a vegetable person, but these look fabulous! I can really get on board with veggies prepared like this! Love it. Yum! This salad looks so fresh and perfect for this time of year. And the dressing is exactly how I like them– light and using fresh ingredients. I love recipes like this! 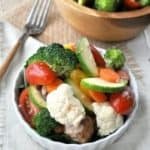 I’m so excited to start getting into the growing season so I can have my fresh from the farm veggies again…will definitely be trying this, Blair! Have a fabulous weekend! Thanks so much for stopping by and for sharing!! Thanks! Bringing this to Easter family get-together. Was fretting over what I could bring that I could serve room temperature and make the night before! Hey, Hannah! It will be perfect! Enjoy the salad and have a happy Easter! I just made this to bring to an outdoor cookout tomorrow. 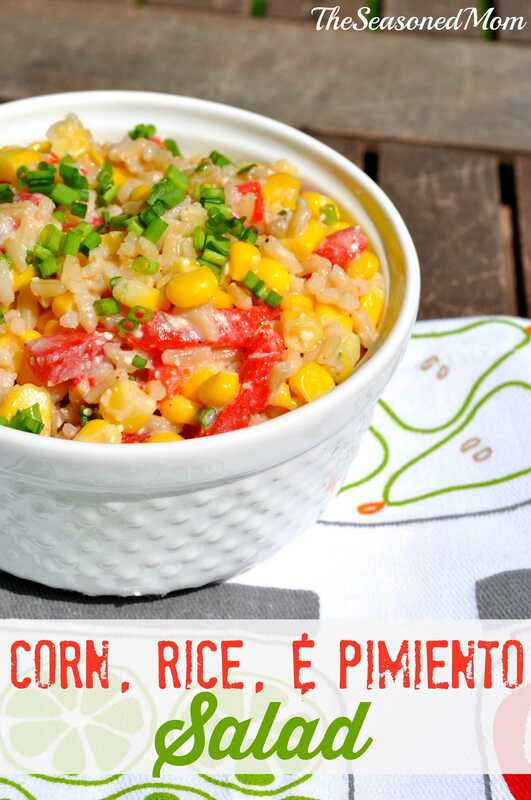 What a great healthy summer side dish! I snuck a few bites and it already tastes amazing- I can’t imagine how delicious it will be tomorrow! Thanks for the recipe.